Ultraframe has recently added new features to both its trade and consumer websites, to assist visitors with finding information about the market leading conservatory roofing system. 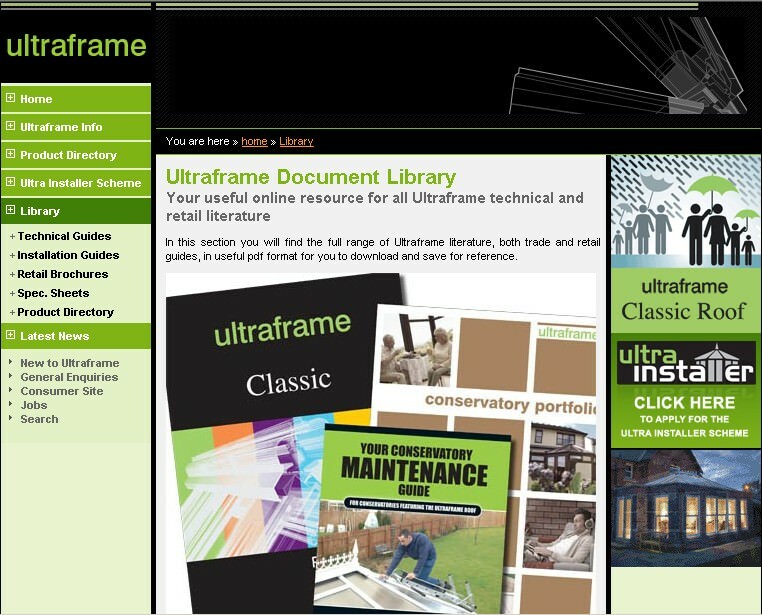 Both websites can be accessed via www.ultraframe.com and provide a useful library of information along with informative and inspirational imagery. 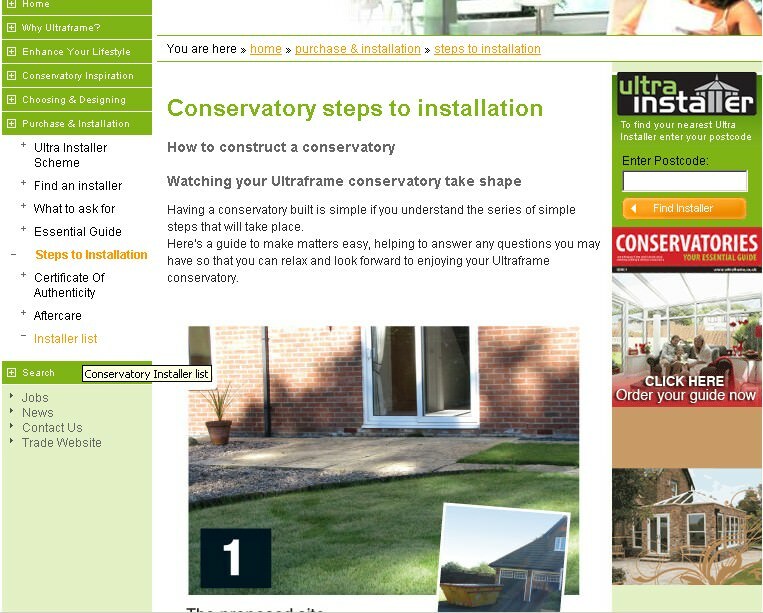 The consumer website, which receives around 10,000 visits per month, has a new animated step by step guide to conservatory installation, helping homeowners to understand exactly what is involved at every stage of the conservatory build process in a series of 32 steps. Each step is illustrated with an image and a simple, jargon-free description. By ensuring that homeowners are fully prepared about what will happen during the building of their conservatory, it will give them more confidence that they will get a great result and lead to a better relationship with the installer, as there should be no surprises! A useful new addition to the trade website is a Library section, where pdf’s of technical guides, installation guides etc for each system are available to download. The Library is split into easy to navigate sections, making it simple for users to quickly access any information they require. Mark Hanson, Marketing Manager at Ultraframe, commented: “We continue to invest in both our trade and consumer websites to ensure that our customers (and their customers) can always access the most up to date information about both conservatories and roofing systems, quickly and easily. We believe that the websites are a great information resource and we strive to update them regularly to ensure they are not only up-to-date, but also so that there is new information to encourage visitors to keep coming back. Online marketing is becoming more important in practically every industry, not just our own, and inline with Ultraframe’s ‘heartbeat’ of innovation and pushing the boundaries, we feel it is important to keep on top of the latest online technology. Ensuring that we have a strong online presence is just one of the ways that we can demonstrate to the trade and to consumers that Ultraframe is the authority on the subject of conservatories, reinforcing our position as market leader and generating business for our customers.” For further information visit www.ultraframe.com, where you can see the inspirational consumer website and also click through to the informative trade website. - Ends - Ultraframe deliver innovative and top quality conservatory roof systems for the trade which suit all styles, all applications, all consumer types and which offer excellent value for money. The market leading company invests heavily in research and development to provide the most technologically advanced and stylish conservatory roofing solutions, maximising light and space. Ultraframe are at the forefront of conservatory design and its systems are mainly used in the home improvement sector but also in new housing and commercial applications in the UK and Europe. In 2006 the privately owned Latium Group, which has many interests within the glass & glazing and home improvement markets acquired Ultraframe. The Latium Group is owned by entrepreneur Brian Kennedy.